Earlier this week the New York Times ran an article on the Trump Administration’s nominee to run the EPA toxics office, Michael Dourson. The article detailed Dourson’s longstanding ties to the chemical industry, citing examples of work he did on specific chemicals paid for by the companies that make or use them. What is remarkable about Dourson’s work in light of his nomination is not just his conflicts, but the fact that his paid work consistently has led to him recommend “safe” levels of his clients’ chemicals that were less health-protective than government standards or guidelines prevailing at the time. The Times article referred to an analysis by EDF in discussing the example of the pesticide chlorpyrifos. Chlorpyrifos is one of 10 chemicals included in EDF’s analysis, which is provided in this post. We then focused on the subset of those papers or reports that argued for a specific numeric “risk value” or release or exposure limit for the chemical in question. That left us with 10 such chemicals. The table here (click to enlarge) summarizes the results of our analysis. It shows who funded Dourson’s work on each chemical. Details of the analysis with links to relevant sources are available here. For all 10 chemicals, Dourson’s recommended “safe” level was less health-protective than the prevailing standard(s) at the time of his work, often dozens or even thousands of times less health-protective – see the right-hand column of the table. Three of the chemicals are among the first 10 chemicals EPA is now reviewing under the recently reformed Toxic Substances Control Act (TSCA). If confirmed, Dourson would immediately be overseeing these reviews. Finally, in every case where Dourson or TERA published a paper of their results, that paper was published in Regulatory Toxicology and Pharmacology. I have blogged previously about the large fraction of Dourson’s papers published in this one journal, which has extensive ties to both the tobacco and chemical industries. 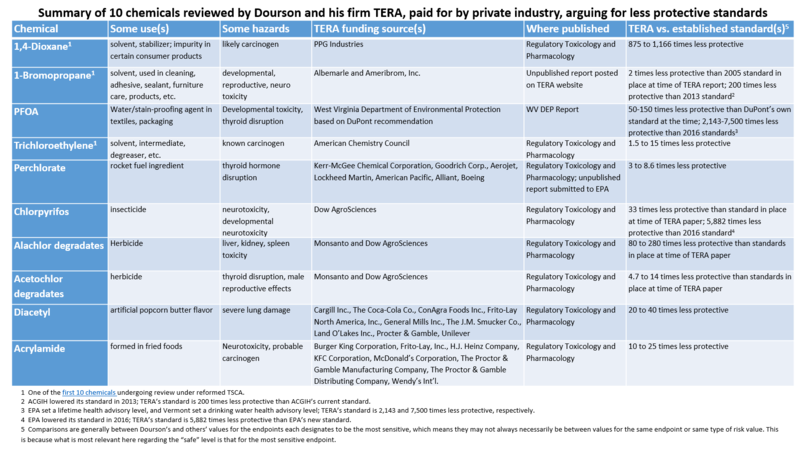 Recently The Intercept uncovered an internal industry memo revealing that chemical company employees regarded Dourson and his firm TERA as the place to go when they wanted to develop a new “safe” level for their chemical and then work to “sell” it to EPA or other agencies. 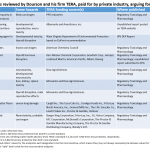 The proof is in the pudding: Dourson has deployed a consistent modus operandi, which as our analysis presented here shows, has led him to consistently recommend chemical safety standards that would weaken our health protections. He’s the last person to be running EPA’s chemical safety program.